You’ve got to get your head together and start concentrating. You’ve got to start a plan. You’ve got to create yourself a list. You’ve got to abide by a schedule. You’ve got to remember to take the trash out. You’ve got to get better grades. You’ve got to be more responsible. You’ve got to take this seriously. You’ve got to get more organized. 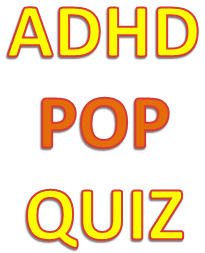 First pop quiz: If you have been told more than 4 of these then you are 9999999.99% sure to have ADHD! Next pop quiz: If you have told these things to your spouse, child, friend or neighbor and have pulled all of your hair out in the process, then whoever that person is, is 9999999.99% sure to have ADHD! Click the “LIKE” button if you are 9999999.99% sure! And/or comment and add your own quiz! Is this an accurate test? No, I made it up, but it ought to be!